An unaltered photocopy of the veteran's casualty report, or death certificate. Contact The War Library if you have other documentation different than the above: 1-562-422-4100 (Pacific Time Zone) or Gold Star Lapel Pin Display Recognition Inquiry. The lapel pin was established by Congress in 1965 (Public Law 534 - 89th Congress) to identify widows, parents and next of kin of service members killed in combat. 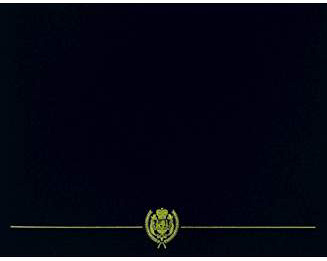 While enacted during the Vietnam War, the award authority is retroactive to World War I, and includes most subsequent conflicts. while serving with friendly foreign forces engaged in an armed conflict in which the United States is not a belligerent party against an opposing armed force. 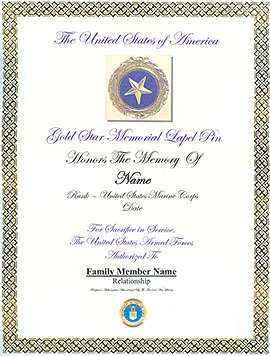 A FREE Black&White (non-color) Display Recognition is available to immediate family members of American [* and non-American] military personnel killed (or deceased) in combat theaters. Immediate Family Members include Parents, Spouse, Siblings and Children. All other family members (nieces, nephews, grandchildren, etc.) are not included in the free Display Recognition Program as per the Department of Defense regulation defining "Immediate Family members". [*] "Immediate family members" of non-American, Allied military personnel are also eligible. 1. Photocopy of military document(s) certifying or establishing veteran's combat theater death. (If the veteran is already listed in The American War Library database, please EMAIL the full copy of the veteran's War Library listing text [cut-and-paste the veteran's War Library listing data] and database record number). Your B&W certificate will be emailed to you within 48 hours... in most cases, sooner.